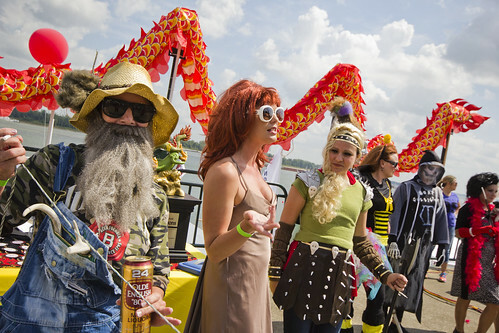 The idea was simple: tell the story of Paducah's annual Dragon Boat Festival from the point of view of its participants. The question was unexpected: Why don't you join the team? Jennifer Kennedy-Haines, captain of the WKCTC crew smiled as she awaited my response. Sure, why not? I'll engage in a bit of gonzo journalism! Then, the trepidation sat in. You mean go out in the midst of the Ohio River in a small boat packed full of a group of strangers armed with nothing but a paddle? My curiosity was too much, however. I was in! 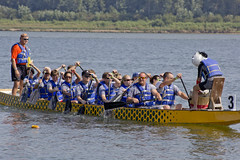 The Dragon Boat Festival, which at that point was in it's third year, had become one of Paducah's premiere fall events. Hosted as a fundraiser for the River Discovery Center, excitement over the 2500 year old racing tradition brought out teams, supporters, and the curious alike. At our first team meeting, I learned about preparation for the race. I was not an experienced rower, but I quickly surmised that most of my teammates were in the same boat. We each arrived at WKCTC's Haws Gym with anything that would suffice as a surrogate paddle (mostly broom sticks). "It's all about timing and staying together," said Jennifer. "You have to be in step with one another. We can have strong rowers, but if you aren't in sequence, it won't matter." We held our "paddles" and conducted a bit of air rowing. But a rower without a boat is a sad sight. We needed the feel of the water. 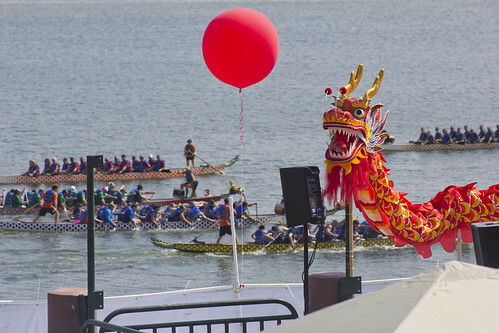 In the week leading up to the race, the teams head down to the foot of Broadway and meet with 22Dragons who provide the boats, training, and a steersman for each team. 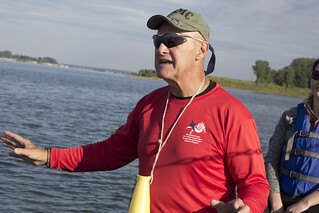 That's where I met "The Colonel," the steersman who would teach us the ways of competitive rowing. The Colonel (I still don't know his real name) is a retired Marine with the looks and gruff voice of a character straight out of a military movie. Nice. I was about to be whipped into shape. We donned our floatation devices, grabbed a paddle, and he strategically placed us according to perceived ability in two neat rows in the boat. We gently paddled our way into the murky waters of the Ohio. We stopped briefly, then the work began. As learned in our training session, timing was everything. With paddles held perpendicular to the water, we sliced straight into the river and pulled back. With each pull, the boat lurched forward with a burst of speed. The burst was short lived, however, thus the need for rapid repetition of said movement. When in unison, the boat sped ahead with great gusto. When not in unison, I felt a jerk and pull akin to learning to drive a stick shift for the first time. It wasn't about strength. It was about teamwork. When race day arrived, nervousness had given way to excitement. 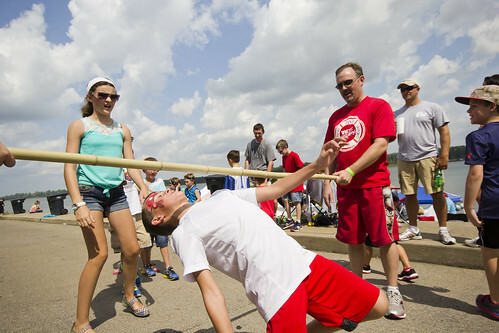 Teams built their stations along the riverfront, each with a different theme. Not only were we competing in the race, we were competing for most team spirit, best dressed drummer (the pace setter), and best team area. 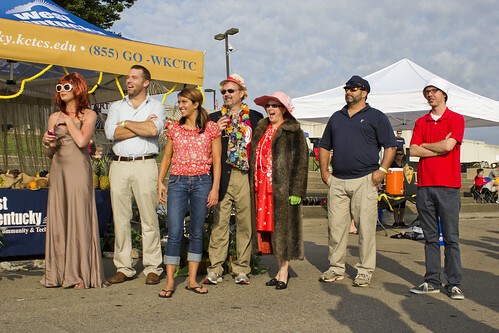 Our theme was Gilligan's Island, complete with the Skipper, Ginger the movie star, Mary Ann, the Professor, the Howells, and, of course, our own Gilligan. We loaded the boat, headed for the starting area, and, with all of the excitement and tension built over the week, burst out with incredible energy. By the end of the first heat, our arms were worn to exhaustion. But we had won! A first for the WKCTC team. What a thrill! In a short amount of time, we'd grown into a team, working together and understanding that each person was only as strong as our desire to be unified. By the end of the day, we didn't place first in subsequent heats, but we did get close. While winning would have provided great satisfaction, the joy of being on the water was more than sufficient. In fact, it had been during our practice where I found the greatest joy and realization of the importance of what we were doing. As we gently paddled away from shore on that very first trip into the water, I watched as downtown Paducah grew smaller in my sight. The sounds of the city and riverfront faded into the gentle lapping of waves against our boat. We paused, not far from Owens Island, and sat for a moment, motionless. The river reached to the sky in tiny peaks, each dipped like a paintbrush in the golden hues of the sun. We slowly paddled forward, approaching the apex of our city. I could imagine the very first settlers traversing the river, discovering that exact same spot nearly two hundred years ago. For two centuries since, many had come along the same path. They too had watched as the City of Paducah rose up from the river on the banks, growing larger in their sight. It was a peaceful, serene moment. 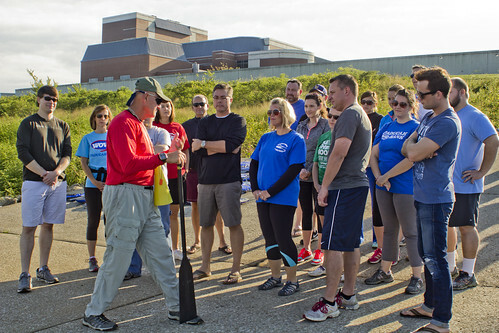 This was about our heritage and our future as it springs from the life of the Ohio River. 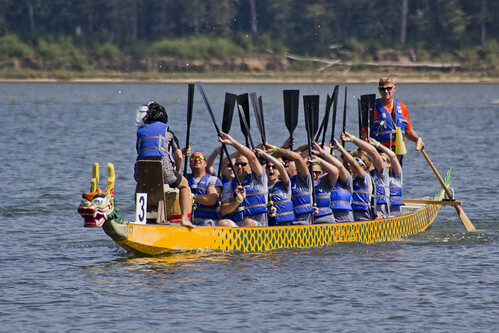 The River Discovery Center raises much needed funds from the Dragon Boat Races, but it also affords many Paducahans an experience like none other. It is a personal discovery of the life, power, and majesty of the river.